The near jubilation emanating from the Stephen Sondheim Theatre as its doors open to let the revelers out is the response to the new season’s Beautiful - The Carole King Musical, a spirited jukebox production which offers a feel good evening of special delight to her fans and all those who just want a slick, nostalgic, music-packed evening of familiar upbeat music unhindered by the hubris of deep insights or messages delivered. Director Marc Bruni keeps the pace kaleidoscopic in Act I’s seventeen numbers, all familiar hits written by Ms. King and her husband /partner Gerry Goffin (“Up on the Roof,” “One Fine Day,” the immortal “Will You Still Love Me Tomorrow?” and “The Locomotion, ” sung by Little Eva who really was the Goffins’ babysitter) augmented by those of their friends/colleagues Cynthia Weil and Barry Mann (“On Broadway,” “You’ve Lost That Lovin’ Feeling.”) These are performed by a versatile cast impersonating the Drifters, the Shirelles, the Righteous Brothers and others from the late ‘50’s and early ‘60’s. Act II’s additional eight numbers (and one reprise) slow the pace a bit as a scintilla of story intrudes. But since the show begins and ends with King’s famous Carnegie Hall concert, earned by her generation-inspiring Grammy Award winning album Tapestry we know, all is well, ending with an audience sing-a-long at the finale – a common phenomenon when the audience already knows the music and just want to be a part of the show. Jessie Mueller, who plays King, has been in the minds if not the hearts of musical theater creators for her previous high profile but low success generating roles: the ill-fated On A Clear Day You Can See Forever opposite Harry Connick, Jr., which garnered her the sympathy vote (Tony and Drama Desk nominations), Cinderella in the Delacorte’s Into the Woods, Nice Work If You Can Get It opposite Matthew Broderick, and the Roundabout’s The Mystery of Edwin Drood. And the mystery is why she hasn’t become a bigger star. Perhaps because there is an inherent blandness to her. In this production she achieves the dubious distinction of being less dynamic and glamorous than the icon she is portraying. True, she is burdened with the dramatic arc of transforming from a cocky teenage bride/composing partner to a single mother in a male dominated field, faced with the serendipitous necessity of writing and performing her own songs, a personal and career choice she never wanted. Indeed, the show opens and closes with her successful Carnegie Hall concert after recording Tapestry, the era-defining, best-selling Grammy winning album. But where is that spectacular, signature blond/gray mane of cascading locks with which we can always identify our diva? Fair of face, pleasant of voice not enough to carry a show. Was there a conspiracy between costume designer Alejo Vietti, make-up designer Joe Dulude II and wig designer Charles G. LaPointe to deprive her of that glamour? Even at the finale? Derek McLane’s minimalist sets, and Josh Prince’s minimalist choreography, appropriate to a jukebox format, maintain that blandness. What brightness there is can be attributed to the orchestrations and music arrangements of Steve Sidwell under Jason Howland’s capable baton and Peter Kaczorowski’s light design. 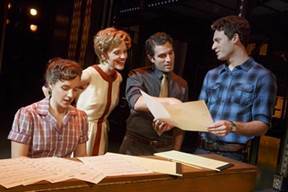 The supporting cast: Jake Epstein as Gerry, Anika Larsen and Jarrod Spector as the other songwriting team Weil and Mann, Jeb Brown as Kirschner and Liz Larsen as King’s mother all do a fine job. 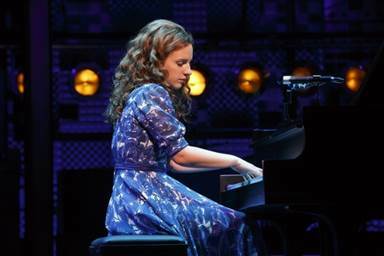 One of the lead producers on this show is Carole King’s daughter, and reports have said that King, having seen an early workshop of the show, refuses to see the final version of the musical because the breakup of her marriage was too painful. There is more drama in that statement than onstage. However, the ubiquitous Ms. King, televised of late at the White House concert/tribute in her honor and her many recent high profile appearances elsewhere, will keep the crowds coming, as well they should.